Stetson University Board of Trustees approved more than $26 million in capital improvement projects at the university’s DeLand and Gulfport campuses, as well as improvements at the university’s location in Celebration. The move came at its Feb. 19 meeting at Stetson’s campus in Celebration, Fla.
“Funding for the improvements come from three main sources: the university renewal and replacement reserve for infrastructure items, facility maintenance and development fundraising initiatives aimed at campus expansion, and borrowing which leverages our current strength for future benefit,” said Bob Huth, executive vice president for Business and chief financial officer. The generosity of donors has enabled the construction of the Marshall and Vera Lea Rinker Welcome Center and the Sandra Stetson Aquatic Center at Lake Beresford. Donors along with increased debt have supported continued expansion and significant renovation of the Carlton Union Building, which will include new dining space, patio dining and expanded student organization areas. In addition, renovation of Griffith Hall is scheduled with space for Student Health Services, counseling and spiritual life. Additional improvements in both Gulfport and DeLand are aimed at improving student residential and learning environments. Moving into 2017 these include infrastructure and maintenance such as plumbing, roofing, and heating and air conditioning for student affairs, academics, athletics and administrative areas. At the College of Law, capital projects include renovations to student housing, classrooms and the Dolly and Homer Hand Law Library, and infrastructure maintenance. Trustees also welcomed new academic and administrative leadership including Neal Mero, Ph.D., new dean of the School of Business Administration; Patrick Coggins, Ph.D., professor of education and multicultural education, incoming chair of the Faculty Senate; and Bruce Chong, vice president for Marketing and Communications. As part of their discussions, Trustees received an update from the Office of Career Development on the 2015 DeLand graduating class cohort and its 91 percent success rate for recent graduates in job placement or graduate program acceptance. Stetson University’s College of Law releases graduate employment information each spring in accordance with American Bar Association requirements. 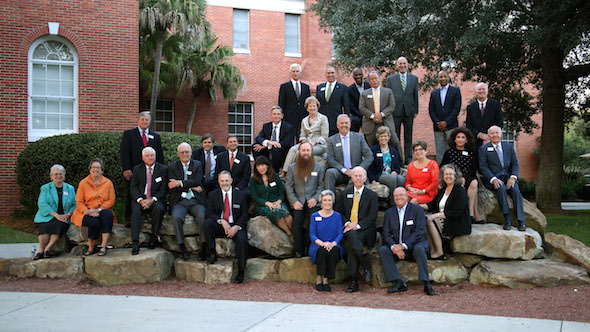 The entire Stetson University Board of Trustees joined Hancock in a review of residential education initiatives related to student housing, and participated in a panel discussion with students on diversity at Stetson University campuses in DeLand and Gulfport, and the movement toward inclusive excellence, a foundational goal of the university’s Strategic Map. Students participating in the panel discussion included two students from the College of Law, Daniel Kavanaugh and Diriki Geuka; and three undergraduate sophomore students from the DeLand campus, Veronica Faison, a communications, media studies and political science major; Luis Melecio-Zambrano, a chemistry major; and Vanessa Petion, a communications and media studies major. The diversity discussion centered on ways to widen participation in diversity and inclusiveness efforts, best practices to communicate those efforts and ways to develop real action-oriented initiatives that will move the university forward.